It's always nice when I get surprised by a new gadget. Samsung asked me if I'd like to review a few items for the holidays. The company sent over a Chromebook 2 and a curved monitor, and before I unboxed them, I was sure I'd highlight the Chromebook and just mention the monitor in the end of the review. 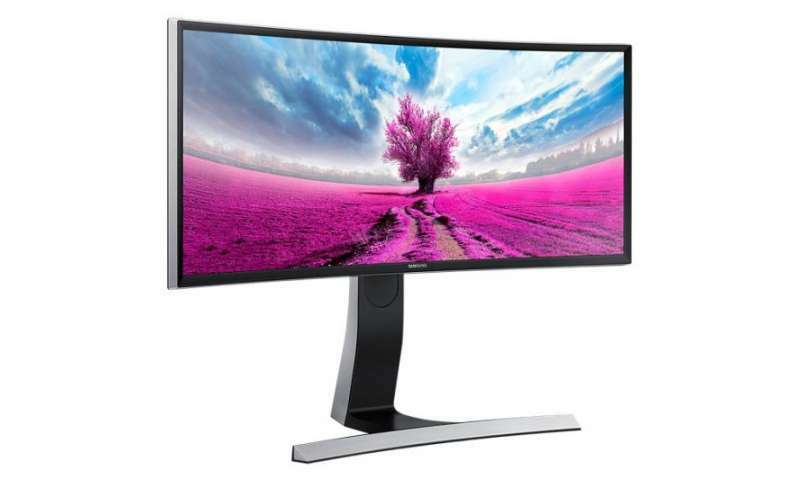 This is a review of the Samsung 29-Inch Ultra-wide Curved Screen LED Monitor (model S29E790C, $599.99, samsung.com), which seems to be the most coveted piece of computer hardware in my building. I get asked by co-workers whether we're all getting the cool wide monitors on our desks. Their second question is usually about the cost because they want one for their home computer. Here's a hint: Check Amazon. In the last few weeks, I've seen them for hundreds of dollars less. So what is it about this monitor that makes it the object of such admiration? I think it's all about the size. The S29E790C has an aspect ratio of 21:9, which is quite a bit wider than the usual 16:9 ratio of an ordinary wide-screen monitor. We've all seen desks with two identical monitors placed side by side. The Samsung S29E790C is like having two monitors combined in one LCD panel. In fact, there are multiple inputs on the back (two HDMI and one display port), and the output from two different computers can be shown on the screen at the same time. This blows my mind. You can have a Mac and a PC side by side on the same screen. The resolution of the screen is 2560 by 1080 pixels. The size of the monitor without the stand is 27.53 inches by 12.34 inches by 2.69 inches. With the stand, the monitor measures 27.53 inches by 16.68 inches to 20.61 inches by 10.33 inches. The middle number in those measurements is the height of the monitor on its adjustable stand. The monitor is easily adjustable up and down and tilts up quite a bit. I found it easy to adjust to my liking. If you'd rather mount the monitor on an adjustable arm or on a wall, it has the standard VESA mounting points on the back. The entire monitor panel and case is gently curved, which makes quite a difference on such a wide screen. I've seen curved TVs described as immersive, but I didn't think it really applied when I tend to sit 10 feet from the set. Immersive is quite an accurate term for the S29E790C when I'm sitting an arm's length from the monitor. The panel has a contrast ratio of 3000:1, which provided deep blacks and bright whites and nice colors. I have to admit, until I read the specs, I had no idea the S29E790C had two built-in speakers. Once I picked the two built-in speakers from my Mac's sound output menu, music from iTunes played from the bottom of the monitor. They won't replace my home sound system, but the speakers are fine for casual listening. This monitor makes me smile every morning when I connect my laptop. It's big and bright and sharp. I wish it had a few legacy inputs, like DVI and VGA, but I understand there are adapters available. I like the built-in speakers and the ability to do picture-in-picture and to split the panel between different inputs at the same time. I can't think of much I'd change about the S29E790C. I'm going to be sad to box it up and send it back. Pros: Beautiful display. Huge LCD. Dual inputs displayed. Bottom line: I'm already plotting to see if my boss will buy one for my desk.